Prime Minister Justin Trudeau denied that senior officials in the Prime Minister’s Office “directed” Jody Wilson-Raybould to intervene in the corruption and fraud prosecution of Montreal engineering and construction giant SNC-Lavalin Group Inc.. Mr. Trudeau made the comments today while speaking at a transit-related appearance in Vaughan, Ont., in response to the Globe’s exclusive that reported the PMO pressured Ms. Wilson-Raybould to intervene while she was in her previous role as justice minister and attorney-general. This is a rapidly developing story and will be updated later this evening. We’ll also have some opinion pieces on the subject that will be posted tonight and tomorrow morning on globeandmail.com. The wreckage of a Canadian Pacific Railway freight train is piled up after a crash near Field, B.C., on Feb. 6, 2019. Canadian Pacific Railway Ltd. is updating regulations to require handbrakes be applied when trains make emergency stops on mountain routes. The change in CP’s operating rules follows the derailment earlier this week near Field, B.C., of a 112-car train that killed all three crew members. According to a railway industry source, writes transportation reporter Eric Atkins, the crew were following regulations when they brought the train to an emergency stop while descending the mountain route because it had exceeded the speed limit. But then the train sat for two hours before beginning to roll away uncontrolled with a replacement crew in the cab. In the suit, the diplomats say Ottawa failed to: warn them about the health risks associated with working in Cuba; remove them from the posting when they showed symptoms; provide them with access to adequate medical care. The plaintiffs include five diplomats two spouses (one of whom works for Global Affairs Canada) and seven children who were diagnosed with the mysterious Havana syndrome, which caused symptoms including nosebleeds, headaches and nausea. George Cope spoke with reporters and analysts on a conference call today after BCE released its fourth-quarter earnings and spent much of the time discussing Huawei, 5G networks and the financial hit (or lack of one) that Bell might face if the Canadian government slams the door on the Chinese telecom company. As telecom reporter Christine Dobby writes, the CEO said Bell is awaiting the results of the government’s cybersecurity review but says there would be no spike in spending if Huawei is banned. Last August, a flash flood overwhelmed the drainage system of the Drake Hotel in Toronto, filling the Drake Underground with about four feet of water. It’s taken six months but the revival of the respected club is well on its way. Though shows have been taking place in the Underground for a few weeks, the official relaunch is set for tonight, which is the first day of a four-day party celebrating the hotel’s 15th anniversary. 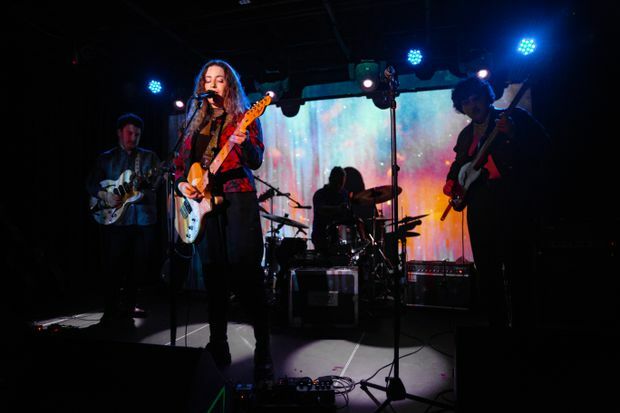 However, as Arts reporter Brad wheeler writes, the Underground’s relaunch happens at a time when the local music scene is in a state of flux. Not only are clubs being squeezed out by high rents, but audiences are changing, too. Canada’s main stock index fell slightly on Thursday, as a drop in oil prices weighed on shares of energy companies and concerns over global economic growth weakened sentiment. The Toronto Stock Exchange’s S&P/TSX Composite index was down 8.95 points, or 0.06 per cent, to close at 15,703.36. Stocks also sank on Wall Street as worries that the United States and China would not be able to reach a trade deal by a March 1 deadline intensified earlier concerns about slowing global economic growth. The Dow Jones Industrial Average fell 218.47 points, or 0.86 per cent, to 25,171.83, the S&P 500 lost 25.53 points, or 0.93 per cent, to 2,706.08 and the Nasdaq Composite dropped 86.93 points, or 1.18 per cent, to 7,288.35. A major natural health convention expected to draw as many as 15,000 people to the Toronto Convention Centre in April has announced one of its main speakers will be anti-vaccination activist Del Bigtree. Mr. Bigtree produced an anti-vaccine film with Andrew Wakefield, a former doctor whose medical licence was stripped after he falsely claimed vaccines cause autism. As health reporter Carly Weeks reports, Mr. Bigtree will be at the Total Health Show to screen the movie and speak about what he describes as the risks of vaccines. Republican senators yesterday urged the top U.S. trade negotiator Robert Lighthizer to counsel President Donald Trump against formally terminating the North American free-trade agreement as a way to pressure Congress to act quickly to approve a replacement deal. A United Nations-led inquiry into the murder of Saudi journalist Jamal Khashoggi said today that evidence pointed to a brutal crime “planned and perpetrated” by Saudi officials. “During an interview to promote his latest revenge flick, actor Liam Neeson reflected ... on an experience in his past, when he reacted with anger and bloodlust after a close friend disclosed she had been raped [by a black man]. ... We do not know what is in Mr. Neeson’s heart today, but there is no way to characterize what he was admitting to as anything other than deeply wrong and hurtful. ... But Mr. Neeson unintentionally did something of a public service: blowing up the poisonous and persistent idea that we live in a post-racial society.” ― Neil Price is associate dean in the School of Social and Community Services at Humber College in Toronto. “As a group of economists, we still believe that facts should matter when it comes to making important policy decisions. Unfortunately, not everyone involved in the Canadian climate policy debate appears to agree. Myths and rhetoric are pushing the real facts to the sidelines. The result is a mix of confusion and polarization that is poisoning our public debate, and we are losing patience.” ― Elizabeth Beale, Don Drummond and Glen Hodgson are economists and members of Canada’s Ecofiscal Commission. Fortnight Lingerie's Toronto boutique is bright and airy, with a warm colour palette. At Fortnight Lingerie’s new boutique, shopping for undergarments feels more like visiting a friend’s trendy, downtown home, writes Caitlin Agnew. Fortnight owner Christina Remenyi is the founder of the nine-year-old brand. She’s opened her first store to showcase her entire range under one roof and demonstrate the benefits of a proper fit. Globe film critic and deputy Arts editor, Barry Hertz tackles a popular topic today: He writes that, despite a few notable exceptions, this year’s Canadian Screen Awards nominees are the most obscure yet. All five films up for best motion picture, for example, are French-language productions and it’s likely that few English-language critics, to say nothing of audiences, have been exposed to. He thinks it’s maddening that so many of this country’s best and most popular films remain mysteries outside their provincial border. And he also wonders what the CSA noms say about English-language productions that can barely catch the attention of the awards body. Last weekend’s cover story, which appeared online and in the paper on Saturday, focused on the data gap in Canada and how when it comes to basic data about its own citizens – from divorce rates to driving patterns to labour trends – we simply don’t have the answers because we don’t have the data. That was the first of several long pieces we’re publishing about the data gap. Today’s story focuses on race, and how Canada lags far behind other countries in tracking how ethnicity affects such things as the labour market, the justice system and health care. It’s written by Tavia Grant and Denise Balkissoon and points out that for a multicultural nation such as ours, the fact that Canada has long been reluctant to collect or publish data based on race and ethnicity is indeed odd. Now, a growing number of groups ― from academics to community organizations ― are pressuring the federal government to address the data gap. In a sidebar, Tavia and Denise report on a growing movement to do away with the widely used (and uniquely Canadian) term, visible minority, because, it’s argued, the term is outdated, generalizing and may hurt some of the very people it was supposed to help by masking diverging outcomes. Separately, but connected, we also have a column on the subject by Andray Domise, a Toronto-based freelance writer, who argues that a lack of data hurts marginalized Canadians.